Posted on 16th January 2012 by Jules. your notice, that the wind has been unprecedented! The wind chill factor has made it seem much colder than the thermometer might suggest. So as temperatures drop and fuel bills inevitably increase, just imagine if half of your precious heat was escaping through your windows! that I found quite surprising; curtains can cut heat loss by 14% whereas roller blinds are double that at 28%. wooden venetian blinds offer a very impressive 50% reduction in heat loss, as wood is a natural insulator. The key to energy efficiency, is the ability to control the energy either created or consumed. Thoughtful use of solar shading is a highly efficient way to achieve such control. 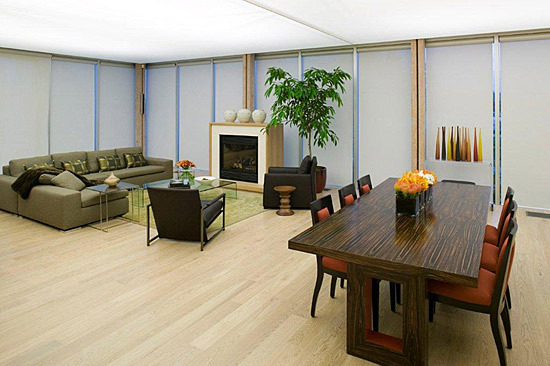 Remote control blinds create a minimalistic method of trapping a layer of still air between your windows or doors, and the internal room space; reducing heat transfer in both hot and cold conditions. Opening the blinds during the day in Winter, allows natural warmth from any available sunlight to warm the interior; this is known as solar gain. Closing the blinds at night, reduces the possibility of that heat escaping. At the other end of the scale, the blinds repel the sun's heat in Summer, preventing unwanted solar heat gain and maintaining a more consistent temperature internally. These very simple steps can reduce the need for heating and air-conditioning, in turn saving you money. This control process is known as the "shading coefficient"; careful choice of window treatment greatly influences the shading coefficient value, thus lowering your heating and cooling expenses. In fact, adding wooden venetian blinds to your window is comparable to installing double glazing in terms of heat conservation! Controliss Blinds are available in a vast array of fabrics and finishes, whether they are mains powered or battery operated. Not only do they make an impressive interior design statement, combined with the ultimate convenience of remote control; they can ultimately save you money by increasing the shading coefficient of your home. have all solar reflectance and transmittance values for all of the fabrics and finishes we use. We can offer an additional stage to increasing your thermal shading requirements, by incorporating a programmable remote control, this facility permits 6 user programmable timed operations per day. The benefit of this programmable feature actually simulates occupancy in an empty house, and will enable the thermal properties of the blinds to utilised even when you are away. 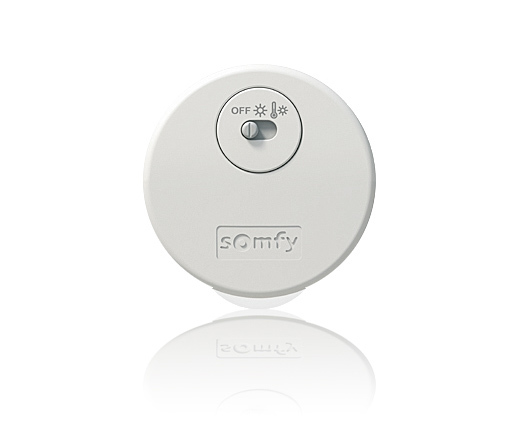 For the ultimate in window blind shading control our wireless Somfy Themosunis indoor sensor will raise or lower the shades automatically according to sunlight levels or sunlight and room temperature. The wirefree easy to use sensor is compatible with all Controliss mains powered blinds and a single sensor can operate up to four Controliss Roller blinds or wooden Venetian blinds. Posted on 9th January 2012 by Jules. Once all the frivolity of the festive season has died down, if you are anything like me, you will be sitting there thinking of all the New Years resolutions you will be making, and most likely breaking! If you have a busy life, as most of us do these days, then generally Christmas time is the only time of year we may be at home, allegedly relaxing! Historically, it as this point we start to make plans for the year ahead, whether it is holidays or home improvements. If you have a home improvement project planned for 2012, then it is never too early to start contemplating the types of furniture and finishes you intend to incorporate. As an Interior Designer, I see the same mistakes made time and time again, where Clients have not planned early enough in advance. When designing a lighting scheme, it is vital that you know what you will be lighting and where it will be positioned. For instance, in a Dining Room, usually one would position the decorative and task lighting directly over the dining table, then the decorative and mood lighting positioned accordingly. If little thought goes in to this aspect early on, the electrician will automatically position the lighting cable at first fix stage, in the centre of the ceiling. The table may not require a central position once the storage and other furniture are included, so floor layouts play a huge part in design, even at first fix electrical stage. We encounter this kind of oversight on a daily basis at Controliss blinds. Our 240v remote control blinds require a switched fuse spur to be installed remotely, from the window. The feed from the spur then runs up to the top of the window reveal, for connection to the roller blind motor on installation. The introduction of this fuse spur and feed should be done pre-plaster stage to avoid consequential damage by having to install retrospectively. If you have the facility within your project, it is well worth considering how you can conceal the roller tube and brackets. Many of our customers, particularly Architects and Designers will make provision to recess the blind tubes within the ceiling recess, or within a stud wall cavity. If you are fitting our 240V electric blinds at a later stage in your project, we are able to offer a very stylish concealed headrail system, called a Contour Cassette system. This system houses the roller blind, and conceals the fixings within, so the result is streamlined and sophisticated, the epitome of design finesse! Our customer service team are always available to offer advice on fabric choices and methods of integration. So if you are currently sitting back, full to the brim with turkey, contemplating your interior projects for 2012, spare a thought for not simply what you wish to achieve, but how!